When buying a car in Oregon, you must obtain certain documents from the seller in order to register and apply for a title in your name. The documents that you need include the bill of sale and vehicle title. You will use these documents to register and title the car you have purchased with the Oregon Driver and Motor Vehicle Services Division (DMV). You will also be required to submit Emissions Test Certificate during vehicle registration. Oregon Department of Environmental Quality (DEQ) is the body responsible for conducting vehicle emission tests and provision of emission test certificates. Armed with the required documents, you will now visit the Oregon Driver and Motor Vehicle Services Division (DMV) office to register and title the car in your name. A signed copy of vehicle title. Bill of sale (Form 735-501). Lien release if the vehicle was financed by the seller. You must take your newly purchased vehicle to the Oregon Department of Environmental Quality (DEQ) for emission tests. Emissions tests are required if you live in Rogue Valley or Portland and you have a car with expired registration papers. These tests are also required if the vehicle you are purchasing is not registered in Oregon. The Oregon DMV warns against buying a vehicle without a title certificate. If the seller doesn’t have a title for the vehicle they are selling, ask him to apply for a duplicate copy for you. If the vehicle you have purchased is not subject to odometer disclosure requirements, you might be able to receive a new title. In Oregon, you can purchase a car without its registration and be able to register in your name with the Oregon DMV. 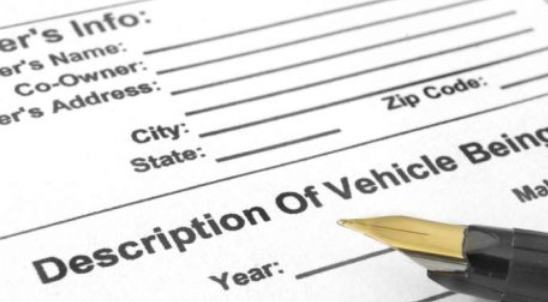 Depending on your situation, you might need a bill of sale when titling and registering your vehicle. Original copy of vehicle title. Bill of sale if the vehicle purchase price is not listed on the vehicle title. Odometer disclosure form if the odometer reading is not listed on the vehicle title. Application for Title and Registration (Form 735-226). Payment for fees: $17 vehicle title. Vehicle registration. License plate fees, which is $12 for 1 license plate and $24 for 2 license plates. You can register the vehicle either by mail or in person. To register it through mail, send all the required documents and check or money order to: DMV Headquarters 1905 Lana Ave NE Salem, OR 97314 Your license plates will be mailed to you after 5 to 10 business days. For a title, you will get it after 3 to 5 weeks. To register the vehicle in your name, take all the required documents in person to your local Oregon Driver and Motor Vehicle Services Division (DMV) office. They often provide the license plates in the same day. But it can be mailed to you if you want to. You can transfer your old vehicle’s license plate to your newly bought vehicle. To do so, you have to pay $6 transfer fee only.